To expect the unexpected is something I have come to cherish about my ventures into the mountains and to discover that Tokyo is home to a long-forgotten Peace Pagoda was definitely one of them. The glistening white Tokyo Peace Pagoda 奥多摩仏舎利塔 Okutama Bussharitou has caught my eye on a couple of occasions, the first time was descending from Mt. 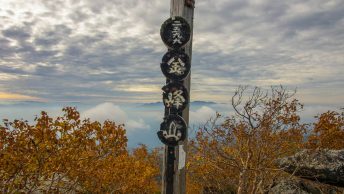 Kumotori and most recently hiking the Nukazasu Ridge to Mt. Mito. A Peace Pagoda is a Buddhist stupa built with the purpose to imbue peace for all people. According to Wikipedia a total of eighty Peace Pagodas have been built around the world in Europe, Asia, and the United States. The instigator for most of these Peace Pagodas was Nichidatsu Fujii a Buddhist monk who was inspired after a meeting with Mahatma Gandhi. While many are located in prominent locations such as the one on the top of Mt. Futabayama in Hiroshima City, the Tokyo Peace Pagoda by contrast remains virtually unknown with little information to reveal its existence. My intrigue finally got the better of me so decided to hike up to the summit of Mt. Odera 大寺山 (980m) for a closer examination. The Tokyo Peace Pagoda is located on the southern edge of Lake Okutama and shares its border with Yamanashi Prefecture. The easiest access by is taking a bus to Miyamabashi 深山橋 where the trail head intersects and is a comfortable one hour hike. Arriving at the top of Mt. Odera I was pleasantly surprised to find its dilapidated facade undergoing some much needed attention and repair. Since its inauguration on August 1st, 1974 it seems to have been sadly neglected apart from the odd coat of paint. The monument itself is substantial, soaring some 45 metres and built on a 55 metre foundation. It comprises four independent staircases which lead to lustrous gold Buddhist statues. Eager to take some photos I snuck under the scaffolding while the two of workers were out of sight. Not surprisingly, I was quickly spotted and prepared for the reprimand. Instead after a cordial greeting I was invited to climb the ladders and take in the panoramic views. We quickly built a friendly rapport and enjoyed sharing morning tea together. What surprised me most was that “the powers that be” had determined that two workers were adequate to get the job done. Even by their conservative estimates completing the preliminary restoration work would take the better part of a year. While I applaud their enthusiasm, toiling away through the winter months on precariously suspended ladders is something I needless to say don’t envy. I wonder if the renovations have been completed by now or not. I believe they have finished the renovations and keen to check out their handy work sometime soon. Renovations are complete. Did this one a few months ago.